This feature combines two or more sales tickets for payment by one person (for instance, a mother and daughter both get haircuts and the mother pays for both transactions). 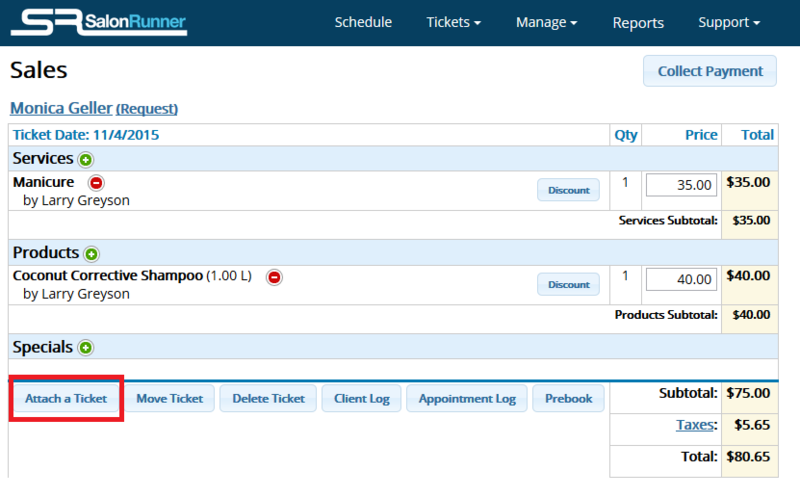 You must have a separate ticket for each individual and then merge them at Checkout to maintain the accuracy of client and employee records. 2. 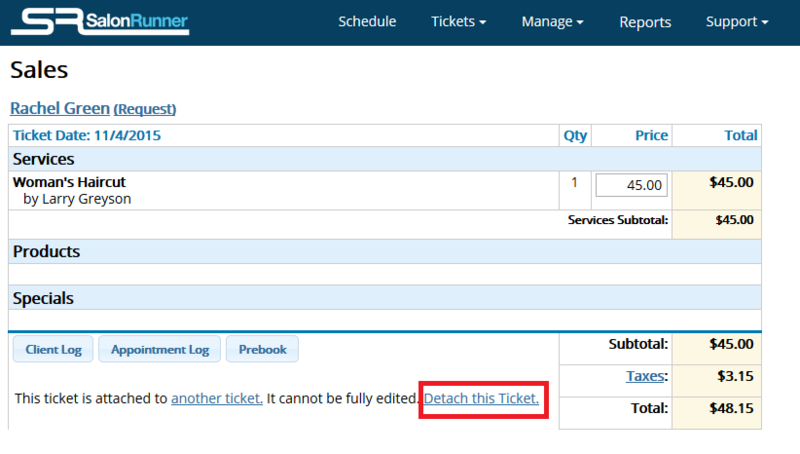 In the Open Tickets column, click the name of the person paying for both tickets. 3. Click Attach a Ticket. 4. In the pop-up that appears, click the next to the name of the client being attached. 6. Repeat if necessary for more than one attachment. 7. Add any other products, discounts, packages, etc. to the ticket, click Collect Payment, and close out the ticket as usual. 8. Once the main ticket is closed and paid, all attached tickets will move over to the “Closed Tickets” side. NOTE: On the ticket screen attached tickets will be marked by, “1” and “2”. Tickets can only be detached before they are closed and moved to the “Closed Tickets”. In order to detach a ticket, go to the ticket that is attached. 2. Tickets are no longer attached. Tickets that have been closed and need an adjustment you will have to Re-Open the ticket to be able to edit or delete the attached tickets. This is done by clicking on the closed ticket and hitting Re-Open Ticket now the tickets will be in the "Open Tickets."